There are a lot of factors to consider when planning or upgrading the lighting in your warehouse. So many that the task may seem rather daunting, but it doesn’t have to be difficult. From the very basic choice of which light source to use to the more complex matter of which light distribution type is best, we’re here to help you make the right decisions. What Type of Light Source Should Be Used? There are three options when it comes to warehouse lighting sources, each with its pros and cons: high intensity discharge (HID), fluorescent, and LED. HID lamps were long thought of as the only option for lighting warehouses and are still often used. This type of lamp has the lowest initial cost. However they also have the highest rate of Lumen depreciation and do not offer many options when it comes to color temperatures. High pressure sodium lamps have a color temperature of about 2200K to 2400K which is very yellow in appearance. While metal halide lamps are around 4000K to 4500K, which is much whiter in color. All HID systems also need a warm up time before reaching full illumination and require a cool down period after being turned off before they can be turned on again. This means power surges can cause the lights to be off for up to fifteen minutes. Fluorescent lighting can be a great alternative to HID lighting for those on a tight budget but still want a more energy efficient solution since they consume less energy than HIDs. They offer a much larger range of color temperatures, from 2700K to 6500K, as well as sizes and shapes to give you a lot more flexibility when lighting your space. The downside to using fluorescents is their operating temperature constraints. They do not function well in areas of extreme cold or heat. So, warehouses that get very cold or hot can have a negative impact on the life span on the fluorescents. Their life span can also be negatively affected by frequent on/off cycles and are therefore not recommended for areas that often turn the lights on and off. 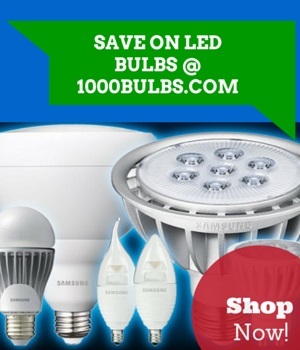 The most versatile and energy efficient choice for lighting your warehouse is with LED light fixtures. They use less energy than any other light source while emitting comparable, if not better, Lumen outputs. LEDs can either be purchased as complete fixtures for new construction or as retrofits for current fixtures. They can also last up to 100,000 life hours, so you won’t have to drag out the ladder or lift to replace a bulb nearly as often, and they don’t suffer from constant on/off cycles the way HIDs and fluorescents do. While they work great in colder temperatures, LEDs can be affected by higher temperatures. Yet the decrease in light output and life hours is often negligible before temperatures around 80 degrees Fahrenheit. How Bright Should the Fixtures Be? The color of your ceiling and walls can make a huge difference in illumination. Lighter colored ceilings and walls have a higher reflectance than dark colors meaning you can use fixtures with a lower Lumen output. These fixtures have the bonus of consuming less power, saving you some money on energy costs. If your warehouse has skylights, you may be able to get away with lower Lumen output fixture as well. However, in this case, it’s more likely you’ll need a way to turn on fewer fixtures on sunny days. You can accomplish this by wiring fixtures to multiple switches and just turning on as many as needed. Lighting Tip: Be sure your fixtures are not only bright enough but also don’t cause a lot of glare which can decrease productivity or result in workplace accidents. An easy solution is to invest in diffuser lens covers. What Color Temperature Should the Lights Be? Color temperature may not seem like an important thing to consider when deciding on the right light fixture for a warehouse, but it can and will make a huge impact on visibility and productivity. Color temperatures between 4000K and 5000K are the best choice for warehouses. This range emits a cool white, sometimes seen as having a bluish tint, which has been proven in studies to help reduce eyestrain and create a productive work environment. Which Light Distribution Type Should Be Used? Warehouses typically need one of two light distribution types, either I or V, depending on the layout of the facility. Space with tall shelving units will need a type I distribution which is a very long and narrow light pattern. This ensures none of the light is lost or blocked by the top of the shelves. If your warehouse has a more open floorplan, a type V light distribution is more appropriate. This light pattern emits light in a wide spread from all sides of the fixture in a circular or square distribution. Learn more about the differences in light patterns in our previous post: Light Distribution Types. How Should the Fixtures Be Positioned? The spacing of your light fixtures is critical. If they are positioned too close together, you’ll experience hot spots and/or glare where the light from one fixture overlaps with the next. If they are positioned too far apart, you’ll get illumination “drop-off” or dark areas. Be sure to map out where your fixtures need to be before purchasing or installing. If you’re unsure about your fixture setup, consult a lighting professional so you aren’t over or under illuminating your space. When it comes to lighting large spaces like warehouses, occupancy and vacancy sensors can be your best friend. Adding one of these motion sensor types to your lighting design can reduce the cost of wasted energy by up to 30% without needing a major update. These sensors turn the lights on and/or off depending on whether or not someone is in the space. Use an occupancy sensors when you want the lights to turn on and off automatically. Vacancy sensors are meant for areas that don’t need the lights to turn on every time someone enters, such as warehouses with large skylights to light the space, but you still want them to turn off when the space is empty. Eager to start your warehouse lighting project? Give our team of lighting specialists a call at 1-800-624-4488, Monday to Friday from 7am to 7pm for expert advice and recommendations.